Central Park Fitness: All about Intervals! This is absolutely one of my favorite topics! Interval training serves a number of purposes. I use it to help improve running speed and performance for distance runners as well as a great method to keep new runners mentally interested. It's a constant change and a great challenge that keeps your mind very focused (some would say have you in fear!). Basically interval training is strength training for the heart. Sometimes people forget that the heart is actually a muscle and like all muscles needs to be trained. We are putting the heart to work harder than it is accustomed to doing for a short period of time, then we bring it down into a recovery mode. So instead of running for 20 minutes straights at 75% of your HRmax, intervals may have you up at 90% of HRmax for 1 minute and then recovering at 50% of HRmax. Add to the mix that your body burns more total fat at higher HR% and intervals are great for those who don't care about performance but do care about trimming fat! In order to perform interval training, there are a couple of things you need to know. First of all, if you haven't been doing any kind of regular exercise, do NOT start doing intervals. If your over age 35 or significantly overweight you should go get checked out by your doctor and get the all clear to start exercising. As I mentioned earlier, your heart is a muscle and like any other muscle if you haven't been using it and then suddenly you go all out, you can injure it. What kind of injuries do heart muscles get? You guessed it, heart attacks! If your in the clear to begin working out, focus on just doing 20-30 minutes of cardiovascular exercise at about 40-50% of your HRmax 3-5 days per week for the first 3 weeks. Then you can consider upping your intensity and working up to interval training. The next thing you need to succesfully begin interval training is to figure out your Target Heart Rate zones. There is a lot of debate about HR Target zones. I'm here to tell you that the zones you see on virtually EVERY piece of cardio equipment in gyms today are bogus! They are NOT based on any modern scientific data. Every individual has a different HRmax and it is difficult to find unless you are in a laboratory setting. The erroneous equation that you see on cardio machines use 220-age to establish a HRmax. This is derived from a quasi-scientific study in the 1920's (almost 100 years ago!!!) and not backed up by any modern data and I fail to understand how this myth lives on! I can tell you personally that I am 33 years old which would mean my HRmax would be 187 according to this outdated calculation. I ROUTINELY climb large hills on my bike where my HR goes up to 191 and trust me, it's a hard effort but I can sustain it for several minutes which leads me to believe my true HRmax is probably around 200. I have trained hundreds of clients over age 50 who easily get their heart rates up into the 170's and 180's when exercising. I have another female client in great shape who at age 41 struggles to get her HR above 155bpm when exercising. A better starting point would be to use the Karvonen formula which still has it's flaws but actually takes into account your RESTING HEART RATE when coming up with a target heart rate range. Here is a great calculator that will give you a side by side comparison of the two methods. Be sure to measure your resting heart rate first thing in the morning after waking up, while sitting down or still lying in bed, preferable after waking up without the aid of an alarm clock and before having any caffeine. Keep in mind, we are looking at general fitness improvement and weight loss for average people. For someone looking at serious world class level of competition we would absolutely seek lab resources to hone in SPECIFIC Hr numbers. The next piece of the puzzle is being able to measure your HR during exercise. While most machines in gyms have HR handles on them, you can't use them while your running at high speed and they often don't provide readings for people. 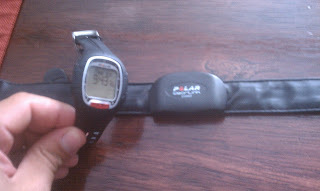 I recommend the use of a POLAR HR Monitor. It comes with a strap and a watch. The HR strap will communicate your HR to virtually every modern piece of cardio equipment in the gym as well as to the watch that you wear which means you can do this interval workout outside if you prefer. Once you have figured out your HRmax the most basic way of doing intervals is to simply work at an effort that takes you up to 85% of your max then bring it back down to 50% of your HRmax. I do this by setting the treadmill at say 9.0 and running for 1 minute, then bringing it back down to a walking pace of 3.5 for one minute. This is the most simplest of intervals. IF you do the math 9.0 +3.5/2 =6.25 mph. So over the course of 20 minutes of intervals, you will cover the same amount of ground as if you ran steady at 6.25 but the difference is that you challenged your heart above what it is used to and then allowed it recover. This process strengthens the heart muscle and your cardiovascular capacity. Over time, you will find that your steady state runs improve. I could write pages and pages about interval training, this is just to scratch the surface and to get the average person thinking about upping your intensity and not getting caught up in doing the same old thing. If you find that your working out as consistently as ever but your results are lacking, start throwing some basic intervals into the mix. As always feel free to comment below or on my Facebook page with your specific questions about interval training. P.S. Heres a great clip of Rachel in action doing some intervals last week! Her heartrate dropped by 40BPM during that 1 minute walk which is a good indicator of her fitness level. Those who are less fit will find that their heart rate stays elevated after the work interval. I love doing intervals on the treadmill. I started my first interval off the youtube video on this post. My endurance really improved after 3 weeks of doing this. My gyms closing down so I'm considering getting on at home. How are the lifefitness treadmills? Are they the same as Lifespan treadmills? WIRFM says the lifespan and livestrong would be an ideal treadmill for my needs but would like to know what your experiences are with them. Never heard of that brand but from looking at your link, they appear to be a pretty standard consumer grade treadmill. Working in gyms, my experience lies mainly in commercial grade equipment of which a treadmill can easily be upwards of $5000 but we are talking about treadmills designed to withstand 8-12 hours of use every single day for years on end. most consumer grade treadmills in the $1000-$2000 price range are perfectly good for the average 2-5 hours per week of use they will see in the home.